In 1982, the Easy Cook concept of fat free cooking was founded in Australia. The appliance now known worldwide as the EasyCook Health Oven™ was developed with portability & fast cooking in mind catering for the home, caravan & people on the move. The first and original Easy Cook was launched in 1984 at Darling Harbour, Sydney Australia with immediate success. The Easy Cook brand name became a leading household name in Australia & New Zealand after a continuous marketing campaign on commercial TV..
After ten successful years the original Easy Cook model was reengineered from the ground up incorporating superior material technology and precision made components. The 1990’s saw the launch of three new improved models along with a larger 13 Litre family sized bowl. One of the major aspects of the superior quality that goes into each and every Easy Cook Health Oven™ is the Easy Cook designed fluted Luminarc® Safety Glass bowl, manufactured by the worlds leading glass company, Arc International SA. Over the last decade, people have a new awareness of the ever-increasing incidence of obesity, diabetes and diet related health issues. Easy Cook is eco-friendly, safe and a natural alternative to microwave cooking. The Easy Cook Health Oven is now sold worldwide and has become part of people’s daily cooking routines. 1991 French made Luminarc® glass bowl was introduced. In order to increase strength & heat retention of the ceramic glass bowl, Easy Cook engineers incorporated a fluted design. 1992 E727 Deluxe™ model launched. 1993 E737 Custom® model launched with exclusive larger sized 13L bowl catering for the family. 1995 Easy Yogurt Maker was introduced. 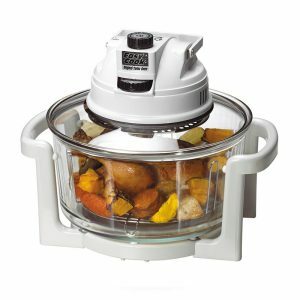 1997 E747 Electronic™ model with 24hr timer, 3-speed fan & larger sized 13L glass bowl. 2002 Relaunch of E717 model based on the “original” style of the TMR1200. 2003 E757 launched 2003 with new hinge lid design. 2005 E970 MULTI5® launched 2005, regarded as a versatile appliance with 5 cooking functions – Deep Fry, Slow Cooker, Boiling, Rice Cooker and Steamer. Designed and developed to be a great compliment to the Easy Cook Health Oven™. 2006 Billy Hot Water Dispenser (E200HW & E300HW). With a low 700W it is suitable for home and caravan and is generator compatible. The Easy Cook Billy gives you instant hot water all day, everyday. 2016 EasyCook Connoisseur Air Fryer (E777 & E797). This versatile model offers the state-of-the-art halogen circular fan forced air frying feature for virtually Fat Free Cooking. These models feature a rotisserie for professional roasting and air fry barrel for perfect air-fried chips, popcorn and frozen snacks. Discover what the EasyCook range of products can offer you.